Ibrance appears safe and effective for men in real-world use. The Food and Drug Administration (FDA) has extended the indication for Ibrance (palbociclib), a CDK4/6 inhibitor, to include men with advanced or metastatic breast cancer. Because most clinical trials of new breast cancer medication enroll few—if any—men, the FDA also considers real-world data from men being treated in clinical practice. Ibrance, from Pfizer, is a cyclin­dependent kinase inhibitor that blocks both CDK4 and CDK6. These proteins play a role in regulating cell division, and blocking them can slow the growth of cancer cells. Ibrance was initially approved for women in 2015. 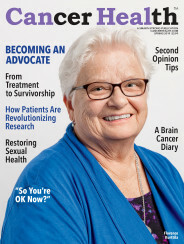 Ibrance is now indicated in combination with an aromatase inhibitor for men and postmenopausal women with hormone receptor positive (HR-positive), HER2-negative advanced or metastatic breast cancer who are starting their first hormone-based treatment or with Faslodex (fulvestrant) in patients with disease progression following prior hormone therapy. Breast cancer is classified by the type of receptors it expresses. A majority of breast tumors in both women and men carry receptors for the hormones estrogen or progesterone, which encourage cancer growth, and treatment typically includes hormone-blocking medications. Aromatase inhibitors such as Arimidex (anastrozole), Aromasin (exemestane) and Femara (letrozole) block an enzyme that converts other hormones, known as androgens, into estrogen. Faslodex works by blocking hormone receptors and preventing estrogen from binding to breast cancer cells. Breast tumors may also express HER2 (human epidermal growth factor receptor 2), making them susceptible to HER2-blocking drugs such as Herceptin (trastuzumab). Triple-negative breast cancer doesn’t express any of these receptors and is more difficult to treat. Men with breast cancer are less likely than women to have triple-negative disease. Nearly 2,700 men will be diagnosed with invasive breast cancer—around 1 percent of all breast cancer diagnoses—and about 500 men will die from it this year, according to the American Cancer Society. Because it is so uncommon, there have been few prospective studies of breast cancer in men, and clinical trials generally include few or no male participants. The 21st Century Cures Act, a 2016 law that aims to accelerate new drug development, encourages the use of real-world data to support regulatory decisions. To fill this gap, Pfizer provided the FDA with the results of an analysis of real-world data from electronic health records as additional supportive data to characterize the use of Ibrance with an aromatase inhibitor or Faslodex in men with breast cancer, based on observed tumor responses. Treatment with Ibrance appears to be generally safe for men as well as women, although side effects are common. Ibrance can cause depletion of white blood cells (leukopenia and neutropenia), red blood cells (anemia) and platelets (thrombocytopenia), which can lead to infections, fatigue and easy bleeding. Other common adverse events include weakness, nausea, vomiting, stomatitis (mouth inflammation), loss of appetite, diarrhea, hair loss and rash. The FDA cautions that patients should have their blood cell counts checked before starting Ibrance and at the beginning of each cycle as well as on day 15 of the first two cycles. Ibrance is the first and—so far—only CDK 4/6 inhibitor to be approved in combination with an aromatase inhibitor for men with breast cancer. At the European Society for Medical Oncology 2018 Congress last October, researchers reported that another drug in the same CDK4/6 inhibitor class, Kisqali (ribociclib), appeared safe and well tolerated for the small number of men in a Phase IIIb trial. Click here for full prescribing information for Ibrance. Click here to learn more about breast cancer in men.